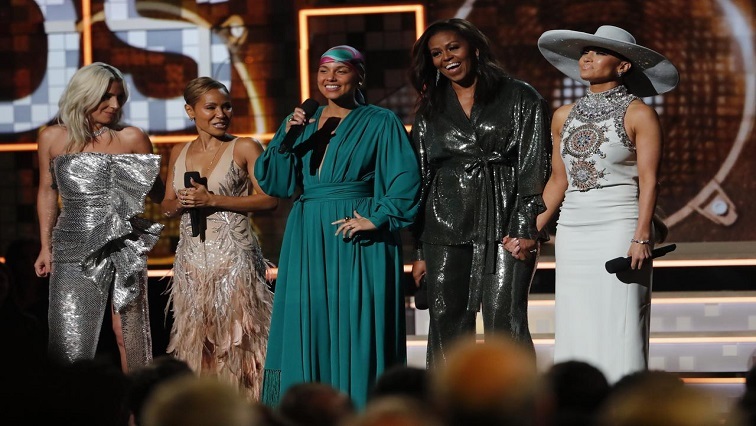 Michelle Obama makes surprise appearance at Grammy Awards - SABC News - Breaking news, special reports, world, business, sport coverage of all South African current events. Africa's news leader. Michelle Obama, wearing a shimmering, silver suit, was briefly interrupted as the crowd erupted in cheers and applause at the beginning of her comments. Former United States first lady Michelle Obama made a surprise appearance during the opening address at the 61st Grammy Awards in Los Angeles on Sunday and was met with a standing ovation from the star-studded crowd. Grammy host Alicia Keys kicked off the show by inviting Obama, 55, along with Lady Gaga, Jada Pinkett Smith and Jennifer Lopez, to share personal anecdotes about how music has changed their lives and empowered them as women. Obama, wearing a shimmering, silver suit, was briefly interrupted as the crowd erupted in cheers and applause at the beginning of her comments. “From the Motown records I wore out on the Southside to the ‘Who Run the World’ songs that fueled me through this last decade, music has always helped me tell my story,” Obama said, referring to the Chicago neighborhood where she grew up. Obama is currently touring to promote her memoir “Becoming,” which was released in the United States and in 28 languages around the world. She and her husband, former US President Barack Obama, signed deals for a book apiece with Penguin Random House a month after Obama left office in January 2017. This entry was posted on 11 Feb 2019,05:38AM at 5:38 AM and is filed under Lifestyle, Homepage Latest Stories Slider. You can follow any responses to this entry through the RSS 2.0 feed. Both comments and pings are currently closed.